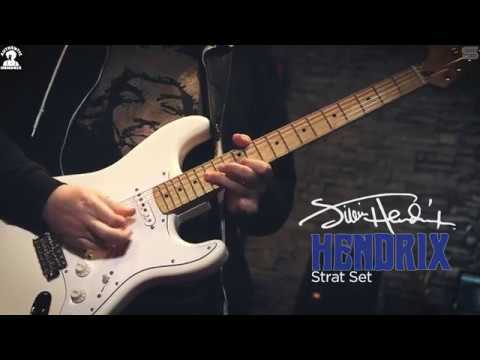 In 1968 Jimi Hendrix played a Strat loaded with pickups hand-wound by Seymour. Fifty years later we are proud to share a piece of that history with you. On a chilly evening in March of 1968, Jimi Hendrix asked a young Seymour W. Duncan to walk his guitar up onstage. That Strat was loaded with pickups Seymour had made just for Jimi, and that unforgettable night would set in motion Seymour’s future – and his legacy almost five decades later. Now you can be a bit closer to Jimi’s world with our Jimi Hendrix™ Signature Loaded Pickguards. To help you to get even closer to Jimi’s earth-shattering tone, each pickup is made with a reverse magnet stagger to capture the effect of playing a right-handed guitar upside-down and restrung for a lefty. The Jimi Hendrix Signature Loaded Pickguard comes packed with a little bit of history as well! Each box will come with a memorabilia booklet of Seymour’s experience with Jimi, as well as a Jimi Hendrix sticker from that era. The 3-ply white pickguard features 250K pots, a 5-way pickup selector switch and .047 caps. A version with the bridge pickup angle reversed (Voodoo route) is also available. Each pickup features Jimi’s signature on the cover. Put a set in your Strat and prepare to be Experienced! The Jimi Hendrix™ Signature Loaded Pickguard is fully authorized by Authentic Hendrix LLC.